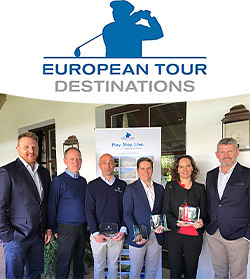 European Tour Destinations, the network of world class golf venues, gathered for its annual conference at Finca Cortesin, Spain, in March to meet, learn from expert speakers and share best practice. Joining established Destinations from across Europe, the Middle East and Asia were new partner venues Moscow Country Club and Tbilisi Hills Golf Resort, Georgia. Entrepreneur Ryan Howsam, Founder and Chairman of Staysure, title sponsor of the Staysure Tour, formerly the European Senior Tour, shared the secrets of his success and intense focus on strategy and customer retention in the over-50s market. Volkswagen Group Director of Customer Experience, Digital Transformation and New Mobility Services, Pedro Mateos Diaz, revealed how leading car brands are painstakingly mapping customer journeys and making every step – from landing on a website to visiting a showroom – an experience, turning customers into fans. And luxury brands advisor and founder of Meerson Watches, Alexandre Meerson, provided unique insights into the world of luxury, changing customer preferences and the growth of personalisation. The conference also hosted European Tour Destinations’ annual awards, recognising the success of venues, based on the network’s ongoing consultancy services, auditing and mystery shopper initiatives. There was also a new award for Most Improved Course Condition, sponsored by Toro with the winning venue, London Golf Club, being presented with an all-expenses paid trip to St Andrews by Senior Sales Manager Andy Brown. Iain McInally, Head of European Tour Properties, said: “The European Tour Destinations Annual Conference is an important opportunity for our venues to come together, network and share best practice. “In addition to the marketing and operational benefits of being a member of the European Tour Destinations network, and the opportunity to host tournaments, it is clear that there is significant value for our member venues in working together, offering members and customers tournament quality experiences on and off the course. Alternatively, you can access the video via the following link. Annual award winners joined by European Tour Destinations representatives. (l to r) Ian Knox, European Tour Destinations Operations Director; Stephen Follett, CEO, London Golf Club; Philippe Pilato, Director of Client Services, Le Golf National; Miguel Girbes, Director of Golf, Finca Cortesin; Rachel David, Sales & Marketing Director, Terre Blanche; Iain McInally, Head of European Tour Destinations. European Tour Destinations is a global network of over 30 world-class golf venues across more than 20 countries on three continents, which all have a close relationship with the European Tour, one of the game’s foremost organisations.